The concept of competitiveness has gained significant momentum in the last two decades, theoretically as well as empirically. Policymakers across the world consider “enhancing competitiveness” as the main goal of economic policy. Despite this, there is a dichotomy about how the concept is perceived. On the one hand, it is associated with the qualities that enable higher living standard for the citizens and on the other hand, it is linked to the locational attributes that drive growth such as low wages, competitive exchange rate, etc. The naïve interpretation of competitiveness as low wages and market share works as follows. Low costs can help companies in gaining substantial market share globally. This implies lower unemployment, higher exports, and higher FDI. 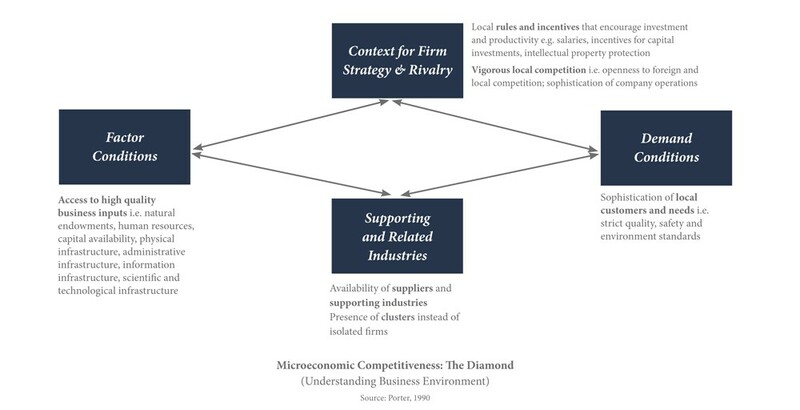 According to this theory, competitiveness is seen as a zero-sum game – one region’s gain would be another region’s loss. It was in response to these misconceptions that Porter (1990) tried shifting the competitiveness debate back to productivity. According to Porter, the central ingredient of competitiveness is productivity which determines a region’s prosperity. Productivity is measured by the value of goods and services produced per unit of the region’s human, capital, and natural resources. Physical factor conditions: Physical factor conditions include the endowments that a region inherits the endowments as well a region Physical factor conditions include natural endowments, like arable land or tree cover, as well as created endowments like the physical infrastructure of transport and energy. Financial factor conditions: This sub-pillar covers the macroeconomic, financial health of the region. It also includes the ability of the population of a region to spend/save, and the ability of financial institutions to absorb those saving and loan out for productive economic activities. Communication Factor conditions: In this era of ICT, communication infrastructure plays a vital role in disseminating information. Hence, maintaining a healthy communication infrastructure has become indispensable for a region trying to be competitive. This sub-pillar is evaluated by measuring the health of information and communication technology in a particular region. Administrative factor conditions: The administrative factor condition is measured by evaluating the condition of law and order, the ability of a region to maintain a healthy workforce and the ease of doing business in a particular region. Human Capacity: Developing human capital in a region is an essential part of enhancing competitiveness and prosperity. Since labor is one of the most basic inputs for production, enhancing labor skills can directly increase productivity. The human capacity sub-pillar is evaluated by indicators such as the proportion of working-age population as well as education and skills of the population in a region. Innovation: A critical in ingredient for staying at par with others is being innovative. Innovation shouldn’t be seen as a one-time thing rather it’s a continuous process. We measure this sub-pillar by evaluating the institutions of higher education and research as well as reforms taken by the government to enhance innovative capabilities of the population. Demographics: The structure and composition of the population ultimately decide the nature of the business and economic activities that can successfully run in a region. To evaluate this sub-pillar, we use the proportion of population falling in different age groups and the density of population in a region. Income distribution: An equal and prosperous society generates demand for better infrastructure, administration and sets the ground for a thriving business environment. To measure this sub-pillar, we evaluate the assets possessed by the population of a region and measures of inequality. Competitive Intensity and Diversity of firms: Diversification of industries increase both competition and competitiveness of a region. Business incentives: Business incentives evaluate the ease of doing business in a region. This includes indicators such as the ease of getting funds for starting a business and labor market stability in the region. Presence of clusters rather than isolated firms offers proximity of upstream and downstream industries and allows for the interchange of knowledge and increases firm productivity. This also helps in meeting depth of demand and innovation. Suppliers Sophistication: This sub-pillar measures the availability of supplies needed for production. The presence of industries producing capital goods and export units are used to evaluate this sub-pillar. Industrial Support: Industrial support evaluates the strength of those institutes and policies that enhance the productivity of manufacturing units. Creation of special economic zones and presence of commercial banks and other financial institutions are used to evaluate this sub-pillar.